Dino & Stacy speak to Joan Lunden, who will be the keynote speaker at the United in the Fight Against Cancer: A Community Conference presented by OhioHealth in Columbus on June 11th at the Greater Columbus Convention Center. United Church Homes proudly introduces the Ruth Frost Parker Center for Abundant Aging. The inaugural event of the center commences Friday, November 11, 2016. Joan Lunden talks about aging as undercover cameras expose ageism and challenge old stereotypes. Joan Lunden reports that close friendships become all the more important the older we get on the TODAY Show. Is a midlife crisis a myth or a reality? 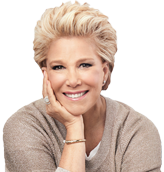 Check out this discussion with Joan Lunden from the TODAY Show this morning. On Saturday May 21, Joan will lead cancer survivors and others in a parade as part of the Amgen Break Away from Cancer campaign. A standing ovation was given to featured speaker Joan Lunden who shared her journey after being diagnosed with breast cancer in June 2014. Now cancer free, she is one of America’s most prominent voices in the breast cancer community working tirelessly to help other women affected by breast cancer. Joan Lunden hosts the Maryland Patient Safety Center's 12th Annual Conference with more than 1,200 healthcare professionals from 81 organizations.